Providing an invisible boundary where pets learn not to venture into is a more effective way of containing our dogs while giving them the freedom to play. An electric dog fence provides such benefits. Unfortunately, picking the right one may not be really that easy as there are a lot of choices in the market. 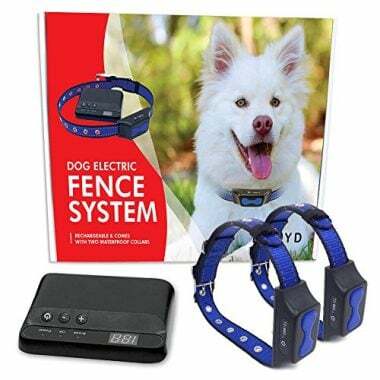 Thankfully, we’ve devoted our resources in coming up with the 15 best electric dog fences in 2019 so you can start installing one for the safety of your pet. 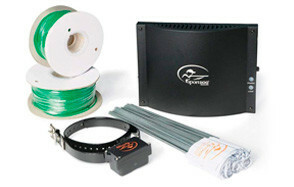 The SportDOG Brand in-ground electric fencing for dogs provides a host of features that everyone will love. First, it includes enough wiring to cover 1.3 acres of property which can be fully expanded up to 100 acres with the purchase of additional wires and flags. The collar receiver is fully waterproof and comes with 4 levels of static correction in addition to the tone and vibration modes. The transmitter can be easily mounted on a wall and comes with built-in power surge and lightning strike protector as well as an alarm system in instances where there’s a break in the integrity of the system. The battery for the receiver should last at least 6 months, maxing at 12 months. The SportDOG’s safety features built into its transmitter is exceptional. It saves you a lot of trouble from facing potentially catastrophic consequences if lightning strikes, power surges, and even shorting do occur. Its expandability is clearly one of its best characteristics, too. Most electric fence for dogs comes with Gauge 20 wiring. The Extreme Dog Fence, however, provides Gauge 14 wires. These are bigger and provide a much safer electrical pathway for the system to work. The transmitter itself is feature-rich, more than capable of covering up to 10 acres. It is highly customizable, too, so you can make sure it won’t interfere with other electronic systems. It has an intuitive computer that compensate for temperature extremes, ensuring the accuracy of warning and correction zones. A surge protector is already included with the system. The Extreme Dog’s features-laden transmitter is something that is a big plus for this particular system. With a lot of customizable options plus built-in safety features, you’ll never go wrong with its 2nd Gen. Furthermore, the use of a larger gauge of wire is exceptional. Getting an electric fence for dogs should not cost you a fortune. For under $100, the PetSafe Basic already allows you to cover a third of an acre of your property while allowing the option of full expansion of up to 5 acres. The accompanying collar is also lightweight and fully waterproof, complete with tone and static 4-level correction. It also comes with a surge protector for optimum security and safety of the system. The PetSafe Basic is ideal for smaller homes that may have a need for such a system. It may be inexpensive, but the completeness of its components makes it a great DIY project. Majority of canine invisible enclosures require some form of digging and laying of wires. This is good if you’re not going to go anywhere else with your dog. As such, when it comes to absolute portability, only PetSafe’s Wireless fence Dog Containment System will do. This wireless electric fence for dogs is pretty much like a wired system except that the physical wire has been removed. Instead, you will be relying on the power of its transmitter which can effectively cover half an acre. The collar comes in various settings and is fully adjustable, too. The PetSafe Wireless is built specifically for travelers, campers, RVers, hikers, and outdoorsportsmen who venture into the great outdoors with their pets. The system eliminates the need for digging and doing a lot of setting up. 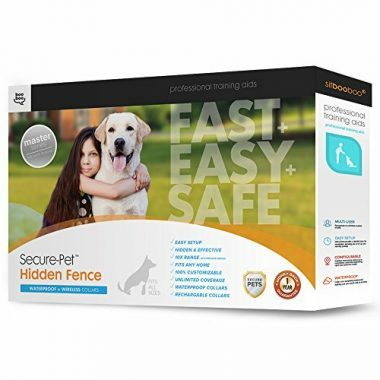 The Hidden Dog electric fencing for dogs is primarily marketed for obedience training purposes especially in the correction of undesirable behaviors by pets. It includes enough wiring to cover an area of 1.2 acres while the system has been fully designed for both underground and above ground installation. The waterproof collar has built-in 5 levels of correction both for training purposes and for containing pets within the predetermined boundaries of the system. Having a system that works both above ground and underground is something quite rare as most are in-ground. This is indeed welcome news for those who dislike digging trenches and don’t believe in wireless systems. 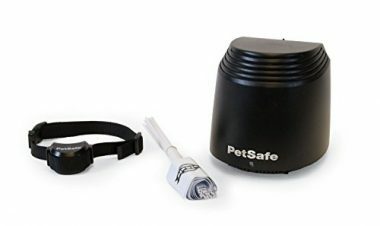 The PetSafe Wireless Fence is a modest upgrade to the PetSafe Wireless Fence Pet Containment System. It adds an additional ¼ acre to its coverage to make it 0.75 acres. The pet zones have also been improved from a 90-foot radius to 105 feet. As always it is fully expandable as long as you put additional PetSafe Wireless systems into the network. It’s easy to setup and comes with a 2 to 3-hour fast-charging collar that should last 3 weeks. The collar receiver is lightweight enough to be used by pets weighing at least 5 pounds. The mere fact that you don’t need to dig trenches and bury any wires is an absolute joy to have. This also means you can actually set virtual fences practically anywhere. This is one of the most important advantages of true wireless systems that somehow PetSafe has perfected. 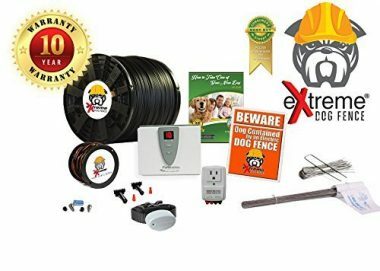 The PetControlHQ Wireless Combo Electric Dog Fence System comes with nearly 500 feet of heavy-duty wire for complete customizability. The dog collar comes with 10 levels of vibration in addition to its 3-level static correction mechanism. While there are no indications as to the actual coverage of the accompanying wire, one can find comfort in the knowledge that it is fully expandable up to 10 acres, provided you get expansion items. Compared to other systems, however, the PetControlHQ’s dog collar is not really designed for smaller dogs. Your pet should be at least 11 pounds to wear it. The inclusion of a 10-level vibration correction module is indeed a good thing to have. At the very least you don’t need to use the static correction as you’ll have plenty of corrections to work with. Sit Boo-Boo’s Advanced In-Ground Electric Dog Fence System offers vast improvements over its Hidden Dog Fence system. It is now fully capable of covering up to 20 acres of land which is quite remarkable considering that it only comes with 500 feet of wire. 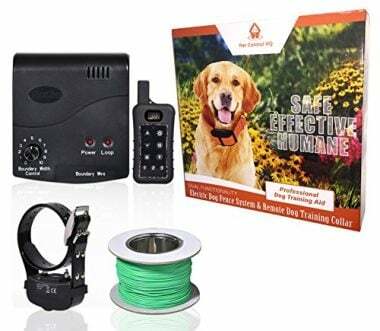 The electronic receiver on the dog’s collar is also built with 3 modes of correction for better control of the kind and level of correction that can be used with your dog. It also features an auto shut-off mechanism to avoid overstimulating your pet. It may be relatively new in the market, but this product by Sit Boo-Boo is strongly making waves. It is unquestionable that Sit Boo-Boo’s 20-acre coverage with just 500 feet of wires is something that is exceptional, considering that similar-length systems can only manage about an acre or so of land area. The auto-shutoff feature is also noteworthy. 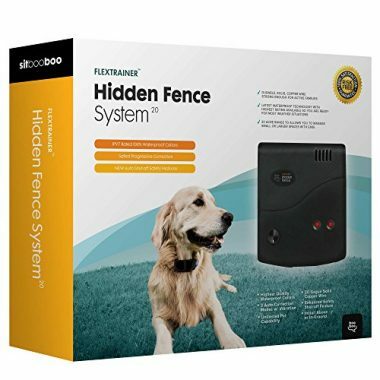 If you already have PetSafe’s Wireless Fence and you’d like to expand you coverage, then this Wireless Instant Fence Extra Transmitter System is for you. It features that same 90-foot radius of pet zones to provide additional half-acre coverage for your pet. Since it is only an expansion system, it will not really work if you don’t have the wireless receiver collar on your dog. It’s best to keep this in mind. The ability to add coverage to your existing PetSafe Wireless Fence is commendable. Our only wish is for it to come in other colors as gray is quite boring. Still, if you don’t mind the color, then PetSafe’s portability and expandability are still great reasons for considering the brand. A relative newcomer in electronic dog fences, Floyd’s Invisible Electric Fence for Dogs offers an alternative to other products. However, it is important to understand that while Floyd provides static correction, one cannot adjust the level of correction. What the company provides is the adjustability of its activation distance. At the lowest setting, the device is activated nearer the boundary wire. At the highest setting, it is activated farther away. The good news is that Floyd is throwing away 2 dog collars with the package that already includes 650 feet of heavy-duty wire. The transmitter may have to be placed in a weatherproof area of your property, though. The inclusion of two electronic dog collars is one thing pet parents can get excited about. So far, the system works if only you can work your way around its rather complicated setup. 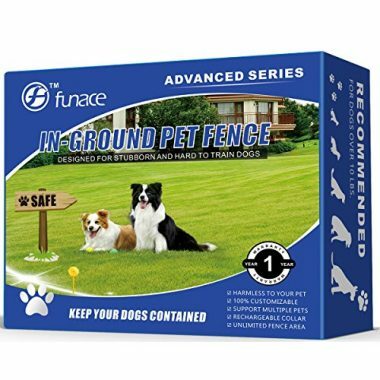 The FunAce Underground Wired Pet Containment System features an IPX8-rated electronic dog collar that charges in 2.5 hours to give it a lifespan of 7 days. This is sufficiently longer than other brands that come with a 5-day charge life. The strength of the transmitter signal is sufficient enough to cover a full 20-acre lot using single-strand 24-gauge copper wire. Some pet parents might have some issues with the thinness of the copper wire as higher-numbered wires are generally less durable than lower-numbered wires. Another point that may be taken against FunAce is their 2-level static correction which, as some pet parents put it, is largely insufficient. Warning tones are emitted about 10 seconds prior to the delivery of the shock, however. The 20-acre coverage is commendable. Its 7-day battery life is also noteworthy. Unfortunately, we really cannot understand the choice of a higher-gauged wire instead of the heavier duty ones. 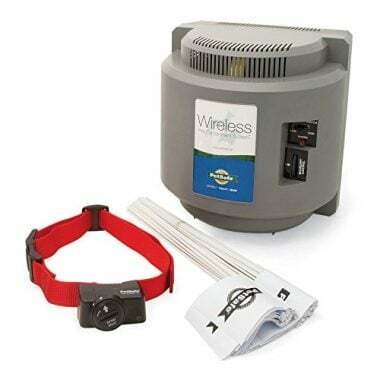 The Free Spirit In-Ground Fence – Underground Wire Containment System offers pet parents with a basic electronic pet fence system that is easy to setup and comes with a nifty transmitter. While it is only able to cover a third of an acre, the system can be expanded up to an acre. This is still substantially less than other expandable systems, some of which can be expanded up to 20 acres. 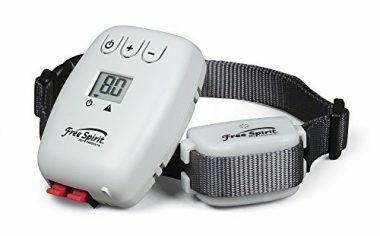 At any rate, it is the lightweight design of the Free Spirit’s dog collar receiver that is quite exceptional as it can be fitted to smaller dogs weighing at least 5 pounds. Other systems have a minimum weight requirement of 10 pounds or so. It’s got 5 levels of static correction, too, in addition to its vibration and tone functionalities. The lightweight design of the Free Spirit is commendable as we believe there are more pet parents who have smaller dog breeds. However, we do find its maximum expandability to be very limited. 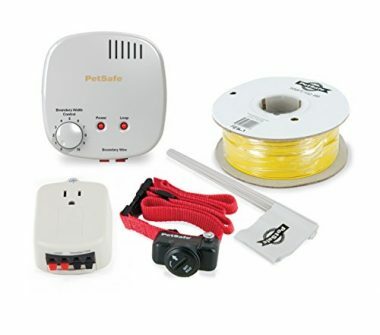 A worthy alternative to the PetSafe Wireless Fence is CarePetMost’s Wireless Electric Dog Fence System. Whereas PetSafe has an effective range of 90 feet in all directions, CarePetMost comes with an effective transmission radius of 550 yards, the minimum of which is at 22 yards. There is no digging or burying of wires involved. If there’s any drawback to the CarePetMost, it will have to be its battery life. While it charges fast, it also drains relatively fast with a standby time of only 12 hours and an effective runtime of or 8 to 9 hours. The intensity of the signal can be adjusted up to 100, thus increasing its effective range. However, you cannot change the levels of correction. But if there’s any indication about its effectiveness, one only needs to look at its growing number of positive reviews. CarePetMost’s 550-yard effective radius is more than 183 times that of PetSafe making it one of the most interesting new entrants to-date. 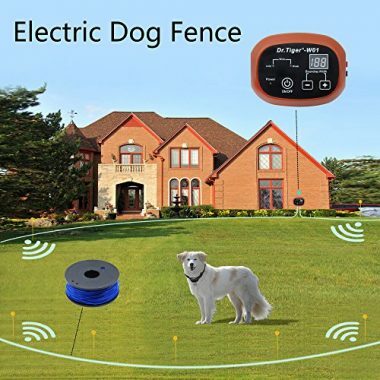 With 650 feet of heavy-duty wire already included in the system, Dr. Tiger Electric Dog Fence offer a system that should complete surround your property. The package already comes with two units of electronic dog collars that deliver both tone and static correction. Unfortunately, the level of intensity cannot be manually selected as the 4-level correction is distance-based. The nearer your pet to the boundary wires, the greater is the intensity of the correction. It already includes 20 boundary flags to help you train your pet. Including an extra dog collar into the package is perfect for households with two dogs. At least you’ll never have to worry about the second dog not having its electronic collar. BARKLO’s Invisible Electric Fence for Dogs is not really that different from other systems. It comes with the same configurable wiring and transmitter mechanisms. It also comes with 650 feet of wiring that should get your property up to speed. The system is fully expandable. However, it has a 5-acre limit to its expansion capabilities; unlike other systems that can be expanded to cover 20 acres. Nevertheless, it provides 2 collars for your 2 dogs. The wiring can be installed above or in-ground so you’ll have the best system according to your needs. The electronic boundaries can also be adjusted with a few presses of a button on the transmitter. 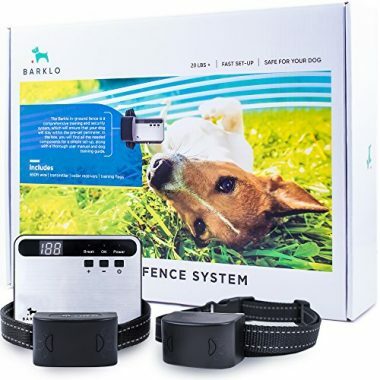 BARKLO is a relatively new entry in electronic dog fences, but it sure knows its stuff. We love the progressive alarm tones as a means to correct your dog’s behavior. We believe this is a lot safer than giving your dog the shock, regardless of how ‘minute’ it may be. How Much Does an Electric Fence for Dogs Cost? Electric dog fences or a wireless pet containment system create an invisible barrier between your property and the outside environment. Wires are placed underground or above ground to approximate the boundaries of your property or where you deem off-limits to your dogs and other pets. This is connected to a transmitter or a monitoring device. A separate receiver is embedded in the dog’s collar. 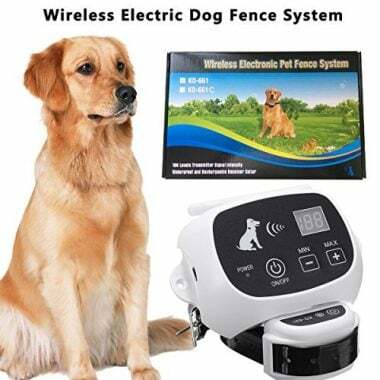 If the system is active, every time the dog goes near the electrically-charged invisible fence, it connects with the collar-mounted receiver to deliver an electric charge which startles the dog but never hurt or injure it. If you do decide to install an electric dog fence, there are certain things that you really have to consider. Typically, you’ll save a lot if you’re going to install it yourself. However, do keep in mind that you will still have to purchase the system and any other extras. Here are the things that you may have to prepare for. Most manufacturers of canine invisible enclosures provide a complete set that already includes the wiring, a dog perimeter collar, and a transmitter. These usually run anywhere from $100 to about $400, although it’s not unusual to find something cheaper or even more expensive. Know that this does not cover installation yet. This is greatly dependent on the size of your property or the actual perimeter of the property you may want to enclose. If you purchase an invisible dog fence kit that already comes with wiring, you may want to look at the length of the included wire as it may not be enough to cover your area. If you’re not going to buy a kit, you can expect to pay around $30 to $70 for your wiring, again depending on the length that you need. If you are going to purchase this separately from the system or if you need an additional collar for some of your dogs, receiver collars usually range in price from $15 to $75 with the average at around $50. Most kits come with one or two collars so this should be enough if you only have 1 or 2 dogs at home. However, if you have quite a number of pooches, you may have to purchase additional units for each one of them. The receivers and transmitters of the system typically run on batteries. As such you are also expected to purchase an appropriate battery charger. As much as possible, don’t get anything without a UL seal. These may save you a lot but they are often at a greater risk for electrical mishaps. You should get a good charger for about $50, although really excellent ones can cost $300 or even more. You may also need to consider the number of units you need to charge at any given time. This should also be factored in your buying decision. It is a general recommendation that batteries be replaced at least every 4 months; that’s 3 times a year. This can easily translate to around $60 up to $90 per year on a single unit alone. Again, you may choose to go on the ultra-cheap side of things but it may not be a wise investment. It’s always safer to choose a UL-tested and certified battery, too. While not absolutely necessary, you may also want to invest in a voltage meter to determine or evaluate the electric charge of the system. Depending on the model or brand of the voltage meter, prepare to pay around $5 for the cheapest or $30 for the more expensive ones. Again, don’t forget the UL seal in these products. Like we have already said, you can install the electric fence for dogs yourself or you can get a professional to do it for you. The only downside to hiring a professional is that you can easily shell out anywhere between $900 and $1,300. This is a rather steep price for installing an invisible fence. The good news is that they do it so efficiently that they can have the whole system up and running in just a short period of time. However, it is always best to check and hire someone with a solid background and certification on these systems. Installing an electric dog fence can be a very fulfilling DIY project if you know what you’re doing. It’s almost similar to erecting a physical enclosure, only this time you will be working with electronic gadgets and gears rather than wood, mortar, or bricks. The good news is that it really is easy to install an electric dog fence. Here’s how. It’s always a good idea to plot your ‘boundaries’ on a graphing paper to get an idea of where to place your transmitter as well as the length of wire that you will need. Do take note that property corners must be designed in an arc as doing it at an angle can confuse the electronic transmitter. Additionally, the wire must form a continuous loop from and to the transmitter. Always consider the presence of other electrical fixtures such as electric wires, TV cables, telephone wires, antenna dishes, or even antenna wires. Never run the invisible fence wires along these structures. Also, do not cross power lines. An excellent place to install the transmitter in is your garage. It’s dry and provides adequate protection for this sensitive unit from the elements. However, it is important not to install it near your circuit breaker. Additionally, mount your transmitter away from other electronic appliances in your garage. Never install your transmitter in a shed or even your barn as the risk of fire or electric shock is simply too great if the unit gets exposed to the elements. In installing the transmitter, make sure to follow the manufacturer’s directions to the letter. Also, don’t forget to ground it. Lay the wire above ground. Using your diagram or your plot lay down the wire along your ‘marked’ boundaries. If there are obstacles within your containment area, you can twist the wires together to cancel the signal. This is especially important in working around swimming pools, landscape elements, trees, and other obstacles. Once you’re satisfied with the layout of your wiring, you can now connect the terminals of your boundary wires to your transmitter. Test the receiver on the collar. With the wires still above ground and the system turned on, get the collar receiver and test if it emits a sound, vibrations, or even delivers a shock – depending on the setting that you’ve programmed on the transmitter – once it is within range of your electric fence. Manufacturers often provide adjustable settings in how near your pet can get close to the invisible boundary before it is ‘startled’ by the system. Check if it is working within your set parameters. Once you’ve ascertained that all of the transmitter, wiring, and receiver are working as planned, you can start fixing the wire in its position. Majority of installers recommend burying the wire about 1 to 3 inches underground. While this is absolutely not necessary, having the wire above-ground can pose some issues later on. If you have a chain-link fence, do not run your boundary wire close to it. If you need to add more wires, make sure that it is of the appropriate size and one that is recommended by the manufacturer. Also, use only wire connectors approved for such a purpose. Always test the connection with the wire connectors on before you fix it with a silicone caulk and electrical tape, once the caulk has dried. If you really have to cross surfaces, you will need to create a trench to put the wire in. Again, you have to check the connection before patching the trench with an appropriate substance. Manufacturers always have recommendations for grounding as several systems have been known to be especially vulnerable to power surges and lightning strikes. Even if your system says it is relatively ‘immune’ from such phenomenon, it is still a lot better to be on the safe side. An invisible dog fence is always an excellent choice for a variety of reasons. Here are some of the most common benefits of an electric canine fence. It’s cheaper than conventional fences. Given a ¼ to ½ acre property, installing a wireless dog fence can set you back by about $220, excluding labor. A wired dog fence can be had up and running for only $100 if you decide to do it yourself. Getting a professional will set you back by about $800 or so. A chain link fence, on the other hand, can easily run anywhere between $1,500 and $3,000 if you’re going to do it yourself. Hiring a professional can easily cost you around $4,000 up to $7,500 for the same size of the lot. Getting a wooden fence is a bit more expensive. A DIY project can cost up to $4,500. Getting a pro to do it will jack up the price up to $15,000 with $5,000 being the minimum. Aside from the cost of installation, maintaining and repairing physical enclosures can also be sources of additional expenses. This is especially true for ranch-type wooden fencing as wood doesn’t really bid well against the elements. On the other hand, while you may have to check the integrity of your electrical system from time to time and replace the batteries several times a year, these should not cost you a fortune. Technically, no matter how you look at it, installing an invisible fence is definitely more cost-effective than a traditional enclosure. It’s a lot easier to install, too. Because there are no physical barriers, you can take pride in your elegant landscaping a lot more. You get to enjoy the fantastic views without any obstructions. This can also translate to a much higher value for your home in case you do decide to sell it. It makes your pets happy. This is perhaps one of the real benefits of having an electric fence for dogs. We all know that our pets require plenty of exercises and play time for them to really feel happy, content, and not develop any behavioral issues that are commonly seen in pooches that are caged all their life. Not only are these pets more emotionally stable, but they are also more agile, stronger, and less prone to the development of canine health conditions, too. Having an electric fencing for dogs also keeps our pets safe. They can roam around freely in our property without running across the street or even wandering into other people’s backyard or property. Some homeowners are not really that kind when somebody else’s pet wanders into their property. You will also have peace of mind knowing your precious pets are well within the confines of your property. Invisible canine enclosures can also be an excellent tool for obedience training. At any rate, the versatility of the system far outweighs any concern that you may have. 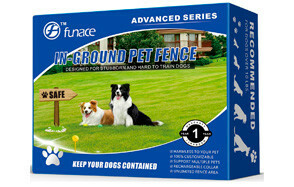 Underground or Above Ground Electric Dog Fence? One of the most common questions that potential users of an electric fence for dogs have is related to the placement of the wiring. Let us look at the merits of each one including their drawbacks so you’ll be able to make the right decision as to which method you will observe for your system. The obvious advantage of an above ground installation is that it simplifies the whole installation process. You simply stretch your wiring along your preferred route and you’re essentially done. You don’t need to remove anything or even dig a trench to run the wiring through. You can also let nature take its course and let grass and weeds slowly cover it over time. The drawback, of course, is that it can be an eyesore to your lawn, backyard, or landscape as it doesn’t really look nice to have an electric wire running across your lawn. While it is true that the wire can be covered by grass, if you happen to forget where it is and you start mowing your lawn, there’s a great chance you might hit the wire. If there is no cover, then kids playing in the area can trip on it. The weaknesses of an above ground wiring installation are undoubtedly the strengths of an underground system. Since the wiring is essentially underground, there are no wires to trip to or even to cut when mowing your lawn. Additionally, people won’t even know you have wires under your property. And it’s safer for kids, too. The negative? Well, you really have to dig trenches and even purposely modify certain structures in your landscape to accommodate your wiring. This significantly increases the amount of time that you will spend and added complexity in installing the system. And if you’re not really that skilled as a handyman, you’ll more likely to do more damage to your property than you ever hope for. You may have the most high-tech invisible electric fence in town, but if you don’t train your dog to get acquainted with the system, you’re only spending on worthless technology. It is for this reason that you take time teaching your dog on its new electric fence the moment you already have the system up and running. Here’s how. 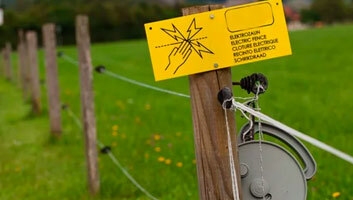 Mark the boundaries of the electric fence with the special training flags that came with your system. Alternatively, you can also use cones to create an outline of your invisible fence. Walk your dog on a leash and follow the border. Make sure the system has been turned off. This is the best time to get your pet acquainted with the flags as well as other new features in your yard. After several rounds following the boundaries of the invisible fence, activate the fencing and continue walking your dog on a leash. Make sure to walk only in areas where there is a warning tone. Do this every day for a week. Attach your dog to a retractable leash and stake this at a point in your yard where its maximum length will only reach up to the area of tone warnings. Let go of your pet, but with the retractable leash on. Let it roam the area. Again, do this every day for a week. Lengthen the retractable leash so that its maximum length now extends beyond the border of the invisible fence. If your dog activates the warning beep, call it immediately, praise it and give it treats. If it ignores your calls, your dog will receive a correction depending on how you setup the system. If this occurs go to your dog and walk it along the border of the fence, making sure it strays into the border and beyond it. This helps reinforce your dog’s recognition of the warning tones and the shock. Over the course of the next several sessions, remove a few of the visual markers. Keep putting your dog on a leash until it has ‘memorized’ the boundaries. Q: How do I fix a wire break in an electric dog fence? A: One of the most troublesome issues with wired electric dog fences is the tendency of the wires to break. It can be due to an accident or it can even be on purpose or it can just be because of an aging system. Regardless of the cause of the break, it is important to fix it so you get to continue enjoying the full benefits of having such an invisible fence around your home. However, before you could even fix a broken wire in the system you should first be able to determine its exact location. Most transmitters come with built-in alarms that will notify you if there is a break in the wiring. You can perform a short loop test or even use an ohmmeter to establish the patency of the transmitter. These tests will only indicate that you have a break in your electric dog fence, however. These don’t tell you where the break is. To do this, you will need to take care of and physically inspect the entire length of your wiring, starting at the transmitter. Follow the wire and carefully inspect every inch of exposed wires. If there are no visible defects you can continue following the path of the wire. If it is in-ground, you will have to observe for any signs of disturbance on the topsoil covering the wire. For instance, if you notice signs of rodent-digging in an area where your wire is located, then you may have a possible break in this location. Pay special attention to areas with heavy foot traffic as well as the edge lines of sidewalks and driveways as these are the most common areas where breaks can occur. If you don’t like such methods you may want to invest in some technologies designed specifically to identify the location of the wire break. Do understand that such systems also have their own limitations. Once you have isolated where the break is, fixing it should be fairly easy. While different manufacturers have their recommended way of fixing breaks in their system, you can always decide to keep it simple. Strip the wire and create a butterfly twist to keep both tires together. Tie a knot in the butterfly twist and secure it with electrical tape. If the tension on the wire is great that doing the butterfly twist may cause further break anywhere along the length of the wire, you may have to cut it and use a splice kit to join the two cut ends. The process will still be the same, except that you’ll have 2 joints instead of one. Q: What is the best wire size for my invisible dog fence? A: Here’s the general rule: the thicker the wire, the more resilient it is against breakage. Electric wires come in gauges such as 14-gauge, 16-gauge, and the like. The number of the gauge is inversely proportional to its capacity and resilience. As such, the lower the number of the gauge (14 vs 20), the more resilient and bigger it is. That being said, deciding on the best wire size for your dog is all a matter of how powerful a digger your pet is. You definitely want a wire that can resist breakage. And if your pet happens to have a knack for chewing on things then you might want a lower-gauged wire. Q: Can I place my wire above ground instead of burying it? A: Depending on the manufacturer of the system you’re buying, you can actually place the wiring above ground instead of burying it. Do take note, however, that there are certain drawbacks to an on-ground layout of wiring as it is physically visible on the ground. Your dog can nibble on the wire if the system is turned off or your pet is not wearing its dog boundary collar. People may also trip on it or may be broken by your lawnmower or any other equipment. Plus, it’s not really a great sight having wires all over your yard. Q: Does the shock from an electric dog fence hurt my dog? A: Advocates of positive reinforcement in canine training will tell you outright that shock coming from an electric dog fence is not a positive way to teach dogs what they need to do. It only tells them what they cannot do. That is why the application of shock should always be done as the last resort since it is a form of aversion technique. A dog avoids the fence because it gets shocked. As for the safety, experts say that it is relatively safe. Unfortunately, there really is no way of telling if our dogs also get hurt every time they are shocked. Regardless of the ‘level’ of static correction, there will still be signs of tissue injury at the site of the metal probes where the static electricity is delivered. Does it hurt your dog? We dare you to try it yourself. If it doesn’t hurt you, then it shouldn’t hurt your dog. But, if you feel even the slightest discomfort with the application of the shock, then you know that your dog will be hurt, too. Q: Is an electric dog fence effective? A: Electric dog fences are not effective in keeping your dog within your premises unless you train them. This is one of the saddest aspects of using technology. People have this thinking that modern technology will answer all of their problems. Unfortunately, no matter how advanced an electric dog fence is, if you don’t teach your dog well enough, then it’s nothing more than a complete waste. Train your dog on how to behave with the electric fence on and you’ll see just how effective it is. Q: Will lightning or weather affect my electric dog fence? A: Most electric dog fences already come with excellent weather-proofing. Some have lightning and surge protectors to help minimize, if not eliminate, the risks associated with such electrical problems. A major concern will be the waterproofing of the wires as well as their resistance to environmental degradation. The good news is that modern technologies are now addressing these issues, creating products that are able to resist environmental and weather changes. Picking the best electric dog fence was a bit tricky as there are great contenders in the list. However, we really had to pick one of each type of invisible fence – wired and wireless. 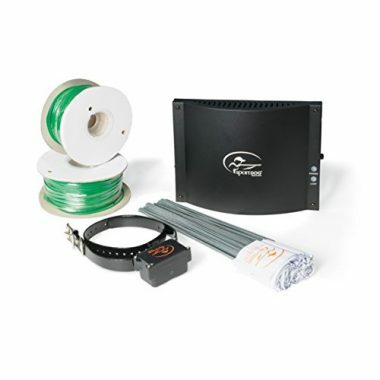 Our pick for the wired electric dog fence is SportDOG brand’s In-Ground Fence System, although PetSafe’s Basic In-Ground Fence came in a very close second. What sold us to the SportDOG is its incredible 100-acre expansion capabilities. As for the wireless system, it was hands-down PetSafe Wireless Fence with a ¾-acre coverage and a 105-foot fully adjustable range. Personally, we do recommend getting the two systems since the SportDOG can be a very useful pet containment system in our homes. 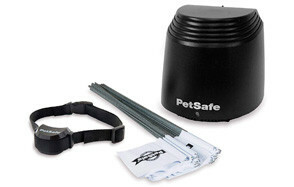 On the other hand, the PetSafe Wireless Fence should really come in handy when traveling with our dogs. 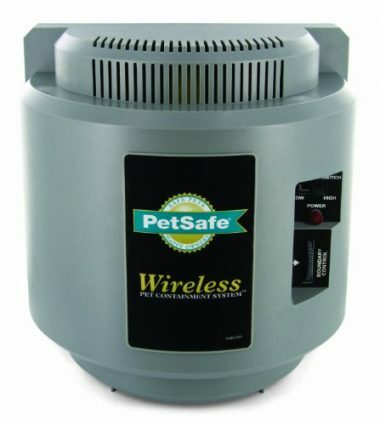 Campsites will be a lot safer for our pets with the handy portability of the PetSafe wireless. More and more dog lovers are installing electric fencing for dogs as a matter of keeping up with society’s expectations for them to be responsible dog owners. Invisible dog perimeter fences are more cost-effective, are easier to install and maintain, and are definitely more beneficial to our dogs’ overall welfare. You can now start installing your own system using any of our 15 best electric dog fences in 2019.